We'll skip the Hungerford and Golden Jubilee Bridges in order to study the next arch bridge along the Thames. The Waterloo Bridge is at a bend in the River Thames, providing great views of London. It has a clean, modern appearance partly because there was no money (during WWII) for ornamentation on the bridge. In fact, this bridge was damaged (and repaired) due to air raids during the war. The bridge was named after the location of the English (and Prussian) victory over Napoleon in 1815. 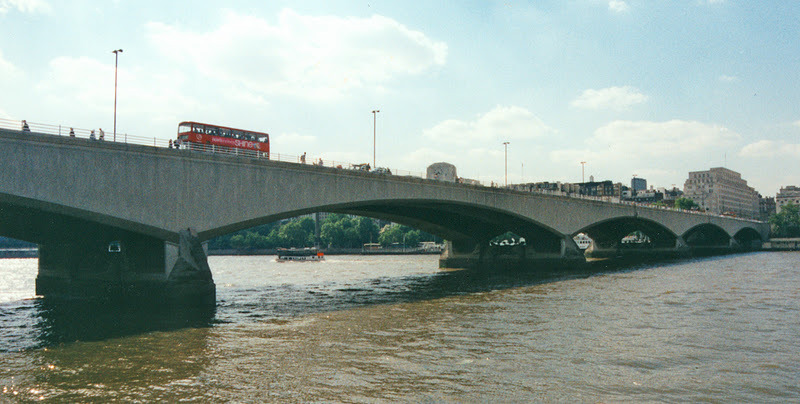 The Waterloo Bridge is a five span reinforced concrete deck arch faced with Portland limestone. It is 1230 ft (375 m) long, 80 ft (25 m) wide, and with 230 ft (70 m) long arch spans. The piers have an interesting shape that mimics the shape of the arches. The bridge was designed by Giles Gilbert, opened in 1942, and became a protected bridge in 1981. On the south bank is the Festival Concert Hall, the Museum of the Moving Image, and the National Theater. On the north bank is Covent Garden and The Strand. The Waterloo Bridge is an attractive structure in an attractive area of London. Thames River Bridges: Waterloo Bridge by Mark Yashinsky is licensed under a Creative Commons Attribution-NonCommercial-ShareAlike 3.0 United States License.